THE ORIGIN OF STAR MAIDEN ENDS! Man, was this one ever fun–which is an odd thing to say considering there’s not a single joke across the six pages of Star Maiden’s origin. To tell you the truth, that was on purpose. To me, it seemed like the most unexpected thing to do with Star Maiden’s origin was to make it as unfunny as possible. 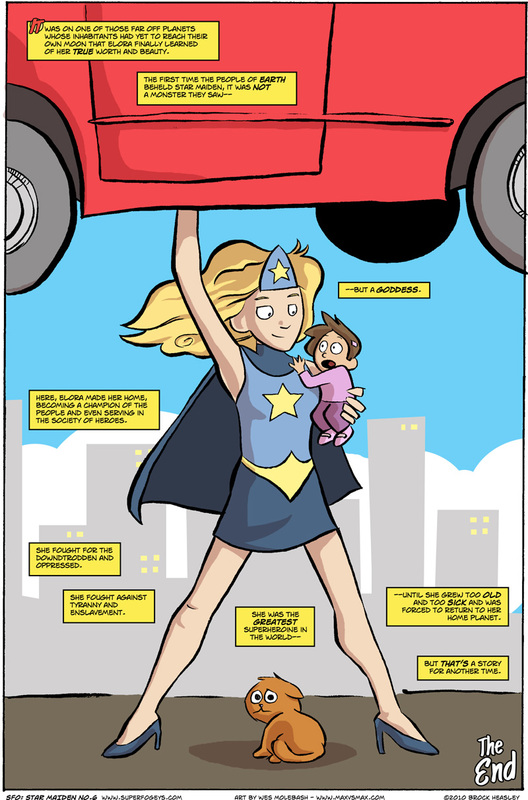 Star is maybe my most favorite Fogey to write precisely because she’s so funny (to me, I realize). Now you see that hasn’t always been the case. Have you been waiting for Star Maiden’s origin to be completed before reading it? Start from the beginning right here. My co-conspirator on this origin was, as you all know by now, Wes Molebash of the great Max vs. Max (currently celebrating its six month anniversary!). Wes was a dream to work with, getting his pages done well ahead of time and always doing a bang up job. His drawings can look deceptively simple–there’s a lot more going on in Wes’ line and in the way he tells his stories panel-to-panel than can appear at first glance. Wes traffics in the observation and subtlety. You’d do well to become a regular Maxreader. Thanks again, Wes! Hope we see you again around here some day. …The Life and Times of Soviet Sam with art by the returning T.L. Collins! Can you believe it’s been 5 months since T.L. last drew an Origins story? I can’t. Well, he’s coming back–and in a big way. 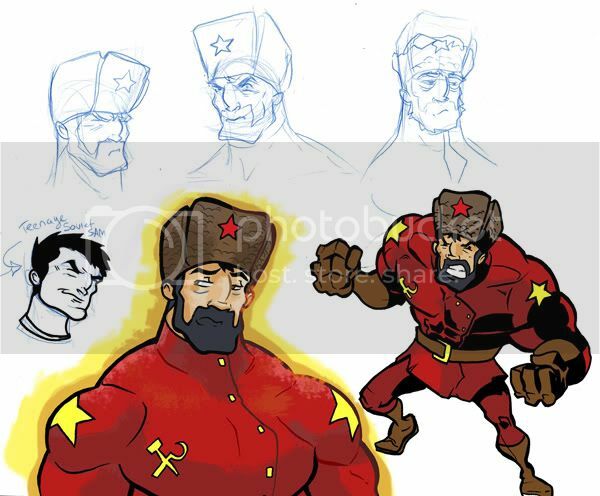 Soviet Sam is a character who has made precisely one appearance in the regular SuperFogeys strip, but who had a big part to play in the Society of Heroes origin starting here. Over the course of the next 8 weeks we’ll track Soviet Sam from his birth right up through the present–including his time in Valhalla. T.L. is so excited about this story that he even set aside his own comic,Bullfinch (go, see! ), for a time so he can focus fully on Soviet Sam. T.L. also recently took the occasion of his return to SFO as an opportunity to refamiliarize himself with Sam and redesign him just a little. Take a look at these new Sam concept drawings. See you on Thursday with SuperFogeys 257!